It's common knowledge that the George Eastman House of International Photography and Film has a phenomenal and growing collection. In particular, I swoon for the large GEH collection of work by my art crush, Edward Steichen. You may also know that Eastman House is home to the L. Jeffrey Selznick School of Film Preservation, and that the museum has collaborated with other academic institutions worldwide to disseminate information on historic photographic processes and the preservation of images. But unless you gain access to the mysterious vaults of the museum's holdings, or take a class with Mark Osterman on antiquated methods of photographing and printing, chances are you aren't aware of just how special to Rochester the Eastman House truly is. The current treat of an exhibition, "See: Untold Stories," better acquaints viewers with the diverse scope of Eastman House's valuable collection, including many images that are barely ever shown. "Untold Stories" is actually multiple mini-exhibitions that showcase seldom-seen collections at Eastman House, as well as many well-produced video stops where visitors can learn about a multitude of historic processes, how and by whom they were developed, what purpose they served, and how to identify images made in those particular ways. Before entering the main gallery space, visitors will encounter the "Photo Film History Timeline," which offers a 48-foot-long guide to important developments in photographic history, while contextualizing the technological advancements in terms of cultural occurrences including science, art, philosophy, politics, wars, communication, and more. The fascinating timeline moves from the 5th century BCE, when Chinese philosopher Mo-Ti made the first known record of camera obscura, to the present day. Inside the gallery, visitors encounter sections on individual photographers' portfolios, as well as segments of pop-cultural interest, such as the "postcards from the trenches" collection of cards from World War I, the peak of the postcard industry, with images that romanticize war. Directly across from these is the innocuous, whimsical, and brightly colored "Neil Winokur: A-Z Portfolio," which presents a different animal or object to represent each letter of the alphabet. Down the way, black-and-white images from Barbara Norfleet's "Cambridge Club: The Oldest Garden Club in America" are cleverly positioned kitty-corner to a sobering Farm Security Administration portfolio that includes images by Dorothea Lange, Walker Evans, Arthur Rothstein, and others. The curatorial staff of this exhibit continues to prove that the wealthy weren't the only ones documented by early photographers, with portfolios by John Thompson, who focused on street life in London, and gave individuality to poverty with portraits of flower sellers, families in caravans, clowns, chimney sweeps, and those still-ubiquitous tempters of the desperate, military recruiters. Physics nerds will delight in the images by Doc Edgerton, who helped advance scientific knowledge with his developments in ultra-high-speed color photography, showcased here with the detailed, captured effects of shooting a bullet through a banana and a flame. The next room over features additional videos on processes and more than a dozen portfolios, including one by Magnum photographer Constantine Manos, whose colorful city scenes build subtle narratives with interacting people, shadows, and fragments of gesture. Philip Halsman's one-day photo shoot of Marilyn Monroe for a 1952 issue of Life Magazine presents the sultry, self-aware icon in familiar and unfamiliar ways. "Marilyn Listening to Music" has the babe positioned near a record player, leaning on a bookshelf wearing a lacey black nothing and an inward expression, and "Marilyn-Mao" is a playful combination of her features on the Chinese leader's head and shoulders. A section showcasing prints from a series of seven portfolios by Ansel Adams presents his predictable epic, sweeping scenes of parks, trees, mountains, and skies, as well as works of unexpected nuance. In "Grass and Pool," silvery stalks of grass poke out from dark, shallow water, surrounded by glittering light and shadows. "Moth and Stump, Interglacial Forest, Glacier Bay National Monument, Alaska" captures a delicate beast in the rambling wild. Another highlight is Robert Voit's "New Trees" series, tongue-in-cheek portraits of badly camouflaged cell towers around the world. 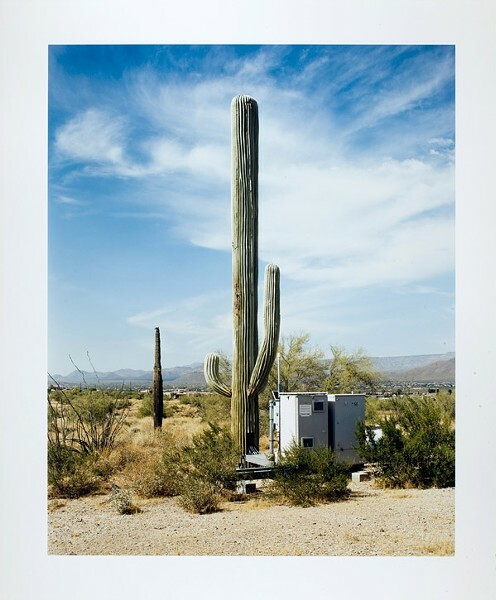 Though the info card states that the photos "raise questions about the omnipresence of technology and health concerns regarding prolonged exposure to high-frequency wavelengths," the artist claims that his "concerns are chiefly aesthetic" as he snarkily points out the conspicuous intruders to the natural environment. Doris Ulmann's images of the Gullah, a vanishing culture of African Americans in the islands and coastal areas of South Carolina, were captured for "Roll, Jordan, Roll," a book by Julia Peterkin. The shots here show off Ulmann's attraction to older faces that bear "the marks of having lived intensely," per the info card. Nearby, Garry Winogrand's "Women Are Beautiful" captures a range of preoccupied, precocious, or provocative ladies from the 1970's. Before exiting to the next gallery, viewers get the treat of Joel-Peter Witkin's recreation of seven household-name artists' works for a New York Times Magazine fashion editorial about hats. Images include Witkin's take on Matisse, Picasso, Hopper, Magritte, Manet, Rembrandt, and Rubens, the last of course featuring an atypically fuller-figured model. Next door in the Brackett Clark Gallery, Eastman House features "Ballyhoo: The Art & Business of Selling the Movies," a fascinating multi-media look at motion-picture promotions from 1925 to 1950. The exhibit explains how, as early as the 1920's, a multitude of smaller media companies began merging into fewer and larger corporations, with an interest in the vertical integration of producing and marketing films. The show includes examples of pre-packaged publicity campaigns created by artists and handed directly to theaters; how marketing hit the streets and the lobbies; and a look at related merchandise, especially where children were concerned. An astute viewer will take what is revealed here about marketing schemes, and apply it to the modern day, with the realization that the marketers have only gotten better at what they do.